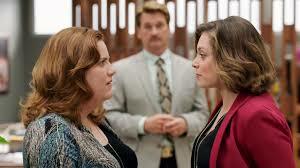 The latest Crazy Ex Girlfriend episode “Who Needs Josh When You Have a Girl Group?” saw a confrontation between Paula and Rebecca (Donnal Lynne Champlin and Rachel Bloom) over the meaning of their friendship. This article contains spoilers so if you haven’t seen the episode “Who Needs Josh When You Have a Girl Group,” please do not continue reading. Friendships are hard to come by and when you develop one, you should do everything in your power to maintain it. There is also the problem of when you have a friend you may take them for granted to the point where they feel that the friendship is one-sided. Such is the case of the friendship of Rebecca Bunch and Paula Proctor. When Rebecca first arrived in West Covina from New York, she and Paula immediately bonded when Rebecca was hired at Whitefeather and Associates. So much so that Rebecca confided in Paula her feelings for Josh Chan, which lead to an official “partners in crime” relationship. It became par for the course that Paula participated in every scheme her friend cooked up to convince Josh that Rebecca was his soulmate. And most of these schemes involved a little law breaking. But regardless of what Rebecca asked, Paula was there for her. The friendship of Paula and Rebecca suffered a rift when Rebecca began dating Greg, but failed to tell Paula about it. When Paula discovered the truth, she was angry and hurt. She felt that Rebecca took her for granted and their relationship was in jeopardy. Fortunately, Paula and Rebecca were able to mend fences and the friendship was saved. Fast forward six months: The Bunch/Proctor friendship is again in peril. It appears that Paula and Rebecca are growing apart as Rebecca has new gal pals Heather (Vella Lovell) and Valencia (Gabrielle Ruiz) while Paula has bonded with law school classmate Sunil (Parvesh Cheena). In an attempt to make Paula part of her “girl group,” Rebecca tricked her into coming over so they could spend some time together, not mentioning that Heather and Valencia would be there too. Rule of a friendship: Honesty is important. Deceiving your friend to get them to do something you want always has negative consequences. But Rebecca wasn’t the only dishonest person in this friendship equation. Bored with the gathering of the girls, Paula had texted Sunil to come and get her by making up an excuse as to why she would have to leave. When Rebecca learned about the texts, she and Paula had it out and feelings of resentment came to the surface. Paula told Rebecca that their friendship was one-sided, she gave more to Rebecca. Then the revelation of Paula’s abortion came out. Again, Rebecca was hurt that Paula had told Sunil and not her. Paula’s argument was a real friend cares enough to find out when they are needed without being asked. I agree with Paula on this and can most certainly understand why she was upset. As a friend, concern should run both ways. There should never be one friend who serves as the sounding board to the other. Everyone has their own problems and things that make them upset and just because one person is more vocal in sharing then the other doesn’t mean the other person doesn’t have something that bothers them. A real friend may tell their problems but should also say “And how are you today?” I believe Rebecca cares about Paula, but as Paula always comes off as confident and in control, Rebecca forgets Paula may need a shoulder to lean on too. Here’s hoping that now that things are out in the open, Paula and Rebecca’s friendship will grow stronger than before. Don’t forget TV time and real time are different. “Fast forward 6 months” is in our time, but I think in TV time it was something under… 3? Depending, I suppose, on how long ago Rebecca & Heather had moved into the new apartment. Josh was complaining that he had broke-up with 2 girls in 2 months.